To a 7 year old girl they were bewildering words, yet the importance of them was real and understood. The room was fading, back into nothingness and the material surroundings once more took control of my senses. Where had I been, I wondered. I had been playing with my spirit friend in the pine trees, as usual watched over by a tall golden glowing lady. My Friend often waited for me to come outside and play in the trees with her and the colourful balls of light that looked like bubbles which she made. She had always been with me, as far as I could remember, even helping me when I was learning to walk and I found it difficult to understand that no-one else could see her or Tall Lady. She was My Friend and whenever we were apart and I thought of her in my mind I could talk to her. There was no need for a name, which seemed to be like a hat that people wore – My Friend was a complete picture and was just there, without havng a name to be called by. One day Tall Lady came to me and said telepathically that The Elder wanted to speak to me. Who The Elder was I didn’t know, but I felt my heart expand with warmth as I stood by her, waiting, then a room appeared around me. This room had what I now recognise as computer screens in it, although these screens were circular, and there was a great window or screen on which I could see the night sky and stars. The Elder said that I had been watched over during these young years and this was the time to remind me that I had agreed to be born on the Earth planet again to take my part in the Grand Scheme of Awakening and Upliftment. He said that I would be trained and helped to recall all I knew, to help other people awaken from their dream states to the truth that each is an expression of the Cosmic Consciousness. The message was conveyed to me in symbols, in pictures with his words and I understood and accepted it all. Many children were visited by them who also had agreed to take part he said, because it was important that all unite in the knowing when the time came, and we would hold the planet in a conscious link with the Cosmic Builders to repair the damage which had occurred on Earth. Each person would be an anchor peg in the construction of the Great Temple of the Planet Earth and would be connected one with all and with The One That Is. I was of That Consciousness which is the Cosmic Consciousness of All Creation and I would realise that, he told me. There was no need for me to speak because he knew my mind and was part of me as he conveyed this to me, along with another stream of information which I knew was being given, but I had no idea of its content except that it was like details of a set plan of action. Tall Lady touched my shoulder and I turned to her. She conveyed to me that I would forget this until years went by and the knowledge and memory would be triggered off. She surrounded me with a sense of love-peace-knowing-caring and she and My Friend and The Elder and the room faded from my sight. Indeed I did forget this and lived my life until certain experiences forced me to look within for answers. Then began a cycle of training and preparation by higher beings on an inner level. The years went by with a few notable psychic experiences of knowing what people were going to say to me and also observing a medium in a spiritualist church giving messages and I knew I would be doing the same. 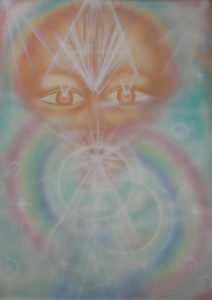 Early in 1988 I followed an inner prompting to begin a guided meditation group and it was after I made the decision to proceed that the above vision came to me. Then my life made sense to me ~ the strong feeling I had experienced about 6 years before that I should be “doing something” and knowing that I should be helping people, but I had to learn to let go of my own mind control and how I thought I should be helping and Trust in the inner promptings which led me into greater realisations and into fulfilling my purpose. This was the beginning of my channelling energy and guidance for personal and world transformation. Has this triggered a similar memory in you? Please feel free to Contact me with your comments or questions.